What Are the Advantages of Outdoor Poly Furniture? If you’ve ever owned outdoor furniture, you know that it can be a challenge to keep it looking like new season after season, year after year. 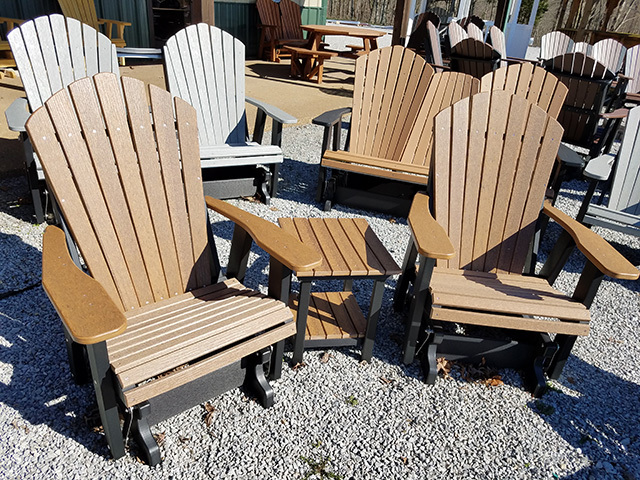 Even the hardiest and most well-treated outdoor furniture, whether it’s made of real wood or metal, is subject to the harsh elements of Tennessee summers and winters. Sunlight, rain, and constant temperature changes are just a few of the factors that go into the beatings that outdoor furniture takes, even in relatively mild and pleasant climates like those we experience in the mid-state area. It’s not uncommon for homeowners to need to replace outdoor furniture just a handful of years after they purchase it due to its relatively short lifespan. At Yoder’s Dutch Barns, we know all of the frustrations that come with outdoor furniture. That’s why we’re proud to offer high-quality outdoor poly furniture. It’s designed to look great for years to come due to the unique materials used in the manufacturing and building process. Best of all, it can be left outside year-round, eliminating the need to move and store it. 1. It’s made in an eco-friendly way—While poly furniture may look like wood, it’s actually made from recyclable plastic. That means it doesn’t require the usage of trees. In addition, poly furniture doesn’t contain any harsh chemicals, which means it’s safe for pets and kids. 2. It’s affordable on a variety of budgets—Some types of outdoor wood and metal furniture may be appealing due to low price tags, but those pieces aren’t built to last, forcing you to frequently replace them. Poly furniture is designed to last for decades, which means it’s a great investment for your home. 3. It’s easy to clean and maintain—The materials used in poly furniture are naturally bacteria and mold resistant, which means cleaning is a breeze. In addition, it’s also designed to stand up to years of rainfall, sunlight, snow, ice, and other types of weather. Stop worrying about your backyard and start enjoying it. Contact Yoder’s Dutch Barns at (615) 789-1030 today to place your poly furniture order and be sure to ask about our satisfaction guarantee.